I was talking to a mom friend the other day. That's often good camaraderie in itself, so I was grateful. 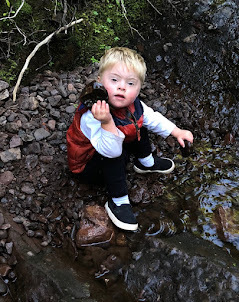 But our conversation brought up a point that most parents might struggle with at times without even realizing. "I would love for my girls to learn to ice skate, but I'm not comfortable enough on skates to teach them," she admitted. That was totally understandable. Kids (or people in general) learn best from someone who is passionate and skilled in the subject at hand. I am pretty comfortable teaching Braeden most things that he has wanted to learn so far, but there is one toy that makes me seize up whenever he brings it over to me. The toy itself is innocent enough. 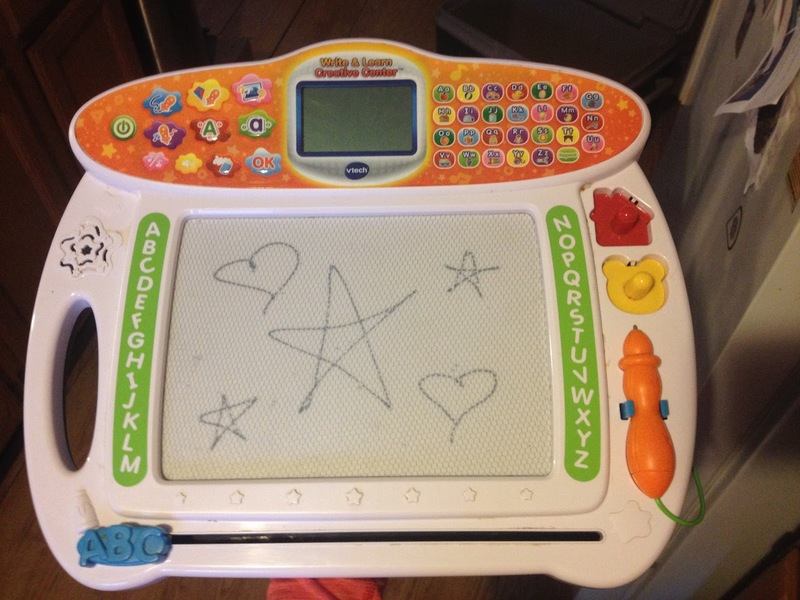 I mean, kids can draw on a clean surface with a magnet pen that remains fixed to the board. No finding crayons. No cleaning up marker from faces. No pages and pages of scribbled artwork to feel guilty about throwing away. Just swipe the lever at the bottom, and the picture is gone forever. There is just one problem I have with this Magna Doodle. 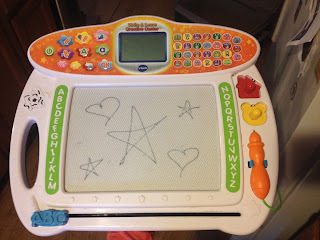 When Braeden comes to me with the Magna Doodle and hands me the pen, I know that I am going to have to draw something. Sometimes he points to what he wants me to draw, and sometimes I have to figure out what to draw that will appease him. If you haven't noticed, I am a writer. Drawing scares me. I am not confident. Nothing I draw looks right. Especially animals, which he loves. I have taken a liking to drawing shapes. Especially hearts and stars. Cubes and triangles. Circles and squares. And those are good for him to learn anyway. But he gets bored with them pretty quick. Before I know it, I have to draw a horse. Or a self-portrait. Or a dump truck. Do any of those things look right? No. But Braeden is usually happy with it, so I guess that's all that really matters. He is teaching me how to go out of my comfort zone with a pen. How to use my imagination on a blank screen for more than just words. How to be okay with the fact that my lion looks like a daffodil with legs. And I am teaching him how to make circles. And lines. I suppose we should start letters soon, too. I am good at those! And if it doesn't look quite right, we can just swipe the slate clean, and try it again. Good morning, Amanda. Just to let you know I have always enjoyed your writings and what you are doing with Branden I think is wonderful. What I think would really help Branden is a brother or sister. Keep up the good work. Just like most things...Keep trying and you will surprise yourself. No one rides a bicycle the first time...not the second and a few folks never! So...keep trying. Books from the library or on line help alot. Love your stories. Hi Amanda, although I purchased your memoir shortly after it was released I set it aside to read after the holidays. Finishing it today I found it to be truly inspirational and thought provoking while also being totally honest from the heart. I really enjoyed your writing style and could not put the book down after starting. Wishing you ongoing success in your writing career and all the very best to you, Brady P and Aaron. Keep letting your light shine!